Spring is bringing us warmer temperatures, sunshine and gnats here in coastal Mississippi. We are also, finally, seeing a few blooms appear in our vegetable patch. My vegetable-gardening efforts are not spectacularly productive, and they certainly don’t save us money on fresh veggies, except maybe fresh-from-the-garden lettuce in winter and spring. It doesn’t matter at this stage. These are the blooms of blueberries and peas? I had NO idea!! They are like the most beautiful and delicate of rare flowers!!! When did you take these pictures? Because these are spectacularly successful in the beauty department! Gnats! It's that time of year again. Oh, but there is no comparison between the taste of supermarket veggies and those harvested minutes before preparing. Think with the price food will be taking, that it may actually become cheaper to grow our own. My garden is in and now I wait hopefully that one last freeze doesn't hit. Nana - you would be so proud of Molly Kate! She waters the flowers that Jeremy planted on our patio every day. We got her a watering can and she takes her job very seriously. She loves watering and always looks for the "weed monsters"! I am hoping you can teach her some of your gardening skills because I have NONE! Ginny, thanks for encouraging words! Marcia, thanks for a new and acceptable expletive (?) to add to my vocabulary. Never thought of it that way until your comment. I think it conveys my total aggravation extremely well. Except that as I write this I have started itching. Evidently even thinking about those little critters creates the urge to scratch! Patti, hope the weather holds. Yes to fresh! Katie, Looking forward to MK and Walker's visit. Yes, she will have a chance to help Nana. Are we going to see some photos on The Daily Skup of her new horticultural skills? 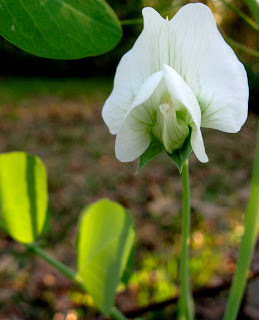 Sandra, My uncle grew what we called field peas, similar to black-eyed peas, but eaten fresh. Crowders, pink ladies, purple hulls. Shelling peas was a social event with cousins and aunts. I still love those peas, but haven't tried to grow those myself yet. Good luck with the veggie growing. I hope to get a vegetable garden going this year. I haven't had one for at least 30 years. I will have to relearn everything I ever knew about it. 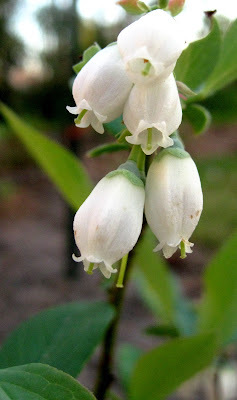 I also had no idea what a blueberry flower looked like. They are quite beautiful. What is going on with blogger? Does hand drying cause ear damage?